[EDIT] I just discovered that this article is posted like 5 times if you follow me. Sorry about that, I kept re-editing the article after posting (post posting. Ba-dum TISH), and because I wanted to, (I had the whole thing in my copy-paste) I would just paste and post, then delete the old one. Ill make a note that it does that, and keep from doing it later. i feel it necessary to apologize for the relative lack of articles recently, despite the fact that nobody reads this. I am not on vacation or hiatus or anything, I just have less time nowadays to play games, watch movies and such. That is, I have a job now, so I have what is probably an average amount of free time versus the obscene amount of free time I had. I'm a bit sad about that as I really like doing reviews like this, regardless of whether I'm good. I'm probably not going to stop, but until I quit Office Depot and/or finish school, there's going to be a decreased frequency of posts. BUT. 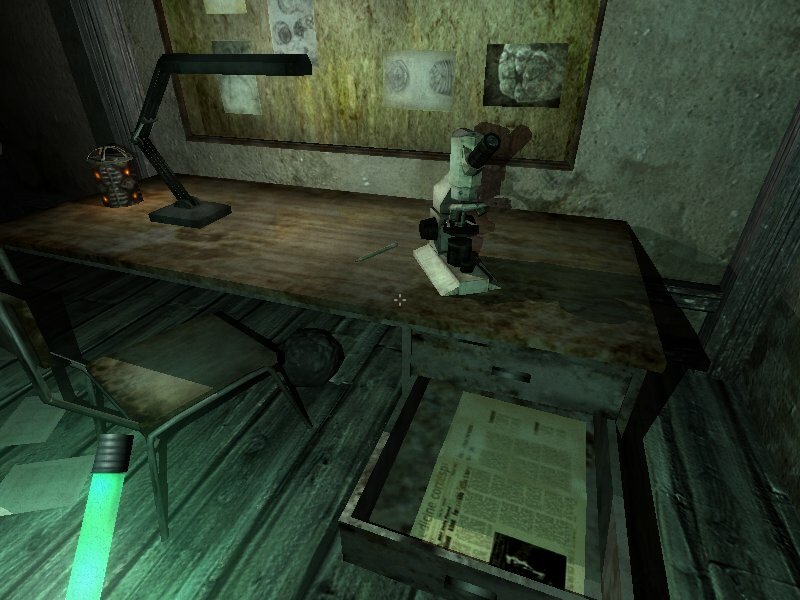 I did get through Penumbra Overture, an excellent FPS version of an old-school point-and-click. The game is made by indie development studio Frictional, and exceeded my expectations despite costing (together with its conclusion game, Penumbra Black Plague) ten dollars. BBBBBbbb..... BBBBBBbbbbb....... BBBBBBBBREAKDOWN! I'm never running out of those. Not much to say here except that they're pretty darn good for a short indie game. Games from companies like PopCap and such that cost the same make you settle for 2D (but pretty 2D) graphics, and the ones that do use 3D don't do it very well. This game stacks up pretty well, besting the Penny-Arcade game easily. It has Halo/Half-Life 2 level shaders, mapping and such. I would compare it to Doom3, as almost everything is bump-mapped. The animations could really use some work, though. Enemies like dogs and spiders (your only enemies) have only simple animations, using only a mechanical "rotate upside down" for dying. The environments are beautiful, full of gorgeous depictions of ice, rusted metal, dirt, and rock. I love the visual aesthetic of ice in its many forms, and this game does it more than justice. Also, you have three handheld light sources at your disposal, as most of the game takes place in a dark arctic mine. Each source offers its own different lighting distance and color, making for different lights being appropriate for different rooms, as well as changing the tone of the game depending on which one you use. This is one of my favorite parts of any game, and if a game can really achieve a good atmosphere and tone, it wins in my book. This game does. There are practically no (ok some) light sources in the game, necessitating the use of the eerily green-toned glowstick or sacrificing some flashlight battery or consumable flares. You are alone almost the entire game, and I won't spoil what breaks that, but I will say that it's really effective. It's the first time since Half-Life (1) that I've been really engaged in a "get out of this broken down facility" type game. It's just you, trying to find something in a mine, surrounded by wolves and solving puzzles. It's hard to explain what makes that exciting, but honestly the isolation factor is great for making it eerie and scary. After a few hours of running around this mine by yourself solving puzzles and evading wolves, you start to get cabin fever. You want out. You don't want out like "turn it off" out, you want out like "get through this for the satisfaction". The game plays like one of those old point-and-click adventures, but its in full 2010 3D. It uses WASD controls and you can hold a weapon, jump with space bar, etc. Swinging your crowbar (I won't spoil it but theres a joke), pickaxe or anything controls a bit clumsily, but its supposed to be because it's not really a fighting game. To swing it, you have to click and hold, then pull the mouse back then thrust it forward. It's mainly used for getting through wood, and attempting to go head to head with a wolf gets you killed. The meat of gameplay is in solving Myst-like puzzles. Again, its a lot like Half-Life 1 where there's a lot of problem-solving with busted machines, clearing obstacles and using intuition. Occasionally you'll have to do the "combine items in inventory" thing, for example you have to open your inventory page, and then double click an item, then place it in the game world. The levels are structured in a way in which you descend into "tiers" of the mine. You become stuck, that is, in one level until you clear a certain obstacle blocking your path by using the parts of the mine (and the items contained therein) that you do have access to "figure it out". You run around in a maze-like section until you beat all the puzzles and finish the last puzzle that, like in many older games, has been staring you in the face for hours, mocking. You know, like in early Resident Evil games where you solved a puzzle or unlocked a door gradually by accumulating keys. Its so satisfying to finally open it. It ends with a cliffhanger, daring you not to buy part2. This is a buy. Sounds good, I've had this game for a while (from the Humble Indie Bundle) but I haven't played it yet. Sounds like I need to!